Lots of people snore. It's nothing abnormal, but it can be embarrassing if someone is sleeping nearby. It can certainly disturb their sleep, and it is likely causing you to get less sleep than you need, as new research indicates that snoring can cause sleep deprivation. Worse, it is considered one of the signs of obstructive sleep apnea, a potentially dangerous condition where breathing actually stops periodically during sleep. In fact, while snoring is often little more than an annoyance, it can have long-lasting negative effects both psychologically and socially, including irritability, lowered libido, and marital distress. If you suffer from this common problem, you may sometimes wonder if there is a mouthpiece that can help you stop snoring. Well, there is! Luckily, you can use a mouthguard for snoring and help yourself—and your partner—sleep better. There are several companies that sell a stop snoring mouthpiece, but there are only a few that I would recommend. You may have searched online for snoring mouthguard reviews and been disappointed. Maybe you weren't happy with the snoring mouthguard reviews you found, or maybe you couldn't find one that would really helped you. After reading this article, you will have a better idea of which mouthpiece is right for you, as I have done the reviews myself and listed the three best mouthpieces that I have found. I took into consideration price, features, customer satisfaction, and ease of use when deciding on which mouthpieces to include in this list. Instead of repeating ourselves, feel free to read our ZQuiet Review for more information on this product and why I think it's the best option for you to try. Keep in mind they offer a 30 day trial for only $9.95! 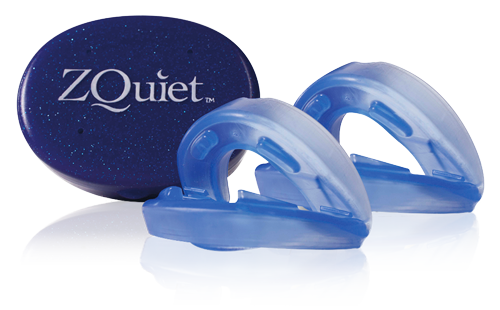 This device is also an extremely effective mouthguard for snoring, but it works very differently from the Snorex. The Intelliguard Pro actually changes the shape of your mouth at night in order to open up the airways and prevent snoring. It's not as hard to get comfortable with as the Snorex, but it is a bit more complicated to use. 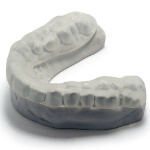 The Intelliguard Pro actually molds to your mouth. The trick is to boil it in water, to soften the plastic, and then bite down on the device to form it to your mouth. There is also a hard plastic part of the mouthguard that can be adjusted in 1 millimeter increments to ensure the best possible fit for you. Morever, the Intelliguard Pro is a bruxism guard, which means that it prevents you from grinding your teeth at night—another common nighttime problem! While not specifically designed as a mouthguard for snoring, the Serenity Sleep Aid is a bruxism mouthguard that can also help you sleep better. Like the Intelliguard, this mouthguard can be custom-molded to your mouth for the best possible fit and effectiveness, and it only takes a few minutes to do! It will prevent you from grinding your teeth in the middle of the night. If you're looking for a stop snoring mouthpiece, don't overlook the Impressive Smiles anti-snoring mouthguard. It isn't designed specifically to stop you from snoring, but people posting snoring mouthguard reviews agree that this one actually does the trick. Just check out the five-star reviews on Amazon. The downside seems to be the amount of time it takes to get used to the feeling of sleeping with the Serenity Sleep Aid in your mouth. After purchasing it, several customers complained that it was uncomfortable, but many satisfied customers say they were happy with the results they got from wearing the Serenity Sleep Aid every night for an extended period. If you don't think you have a problem with grinding your teeth during the night, and you don't mind the way you look when you sleep, the SnoreX mouthguard is probably the best pick for you. If you do have a problem with grinding your teeth, or you are worried you might, but your main problem with getting a good night's sleep is snoring, then you should consider the Intelliguard Pro. Finally, if you have a problem with grinding your teeth but you know you also snore throughout the night, the Serenity Sleep Aid is going to be the best overall product for you to use. A﻿﻿﻿﻿﻿lso check out anti-snoring chin straps. There are dozens, if not hundreds, of products to consider when looking for a mouthguard for snoring, but I have done the work and the research. I have scoured as many snoring mouthguard reviews as I could to determine the three best ones on the market. When choosing which one is right for you, I believe you should start with any of the above three before you consider anything else. There are other products, as well, such as chin straps, but if you're looking specifically for a mouthguard, these are the ones to choose from.